Exquisite Corpse - Journal of Letters and Life - Perseveration happens! This article has been reprinted from the journal Aphasiology, Vol. 21 (10-11), 2007. It appeared as an introduction to a special issue volume on Verbal Perseveration , edited by Dr. Jaqueline Ann Stark. Both Dr. Stark and the editor of the journal, Dr. Chris Code, School of Psychology, Exeter University, UK, have graciously given me permission to reprint the essay in The Exquisite Corpse. We thank them for doing so. Patients with recurrent perseveration as part of a fluent left temporal lobe aphasia often consciously intend to produce a requested target on confrontation testing in the clinic. However, suddenly and quite unexpectedly, they will have a perseveration happen to them. Being focused on the task at hand, and having no discernable attention deficit, the modular and automatic utterance of a whole-word perseverate will startle patients, leaving them puzzled and at a loss to explain such a blunder. In this paper the claim is made that, in a sense, these patients have found themselves at the nexus of the conscious and the unconscious. This phenomenon is discussed based on data from a longitudinal study of a patient who has classical conduction aphasia with several word-finding deficits, but intact comprehension and attention. He perseverates only in the response modes that have been compromised by his brain damage. This essay will concentrate on the recurrent perseveration of the whole word “predilection” form / peɪpər / “paper,” together with slightly altered forms, most of which were the phonological alternate / pεpər / “pepper,” itself a word in English. There is no semantic relation between these words, but they are close associates phonologically. Both are two syllable trochaic items that share all but the initial nucleus. There were other non-word productions such as / sleɪpər /, most of which were formed by a phonemic carryover from a close-order word with an /sl-/ onset. Interactive blendings in this patienthave been previously reported in Buckingham and Christman (2004). This patient was right handed, had a single stroke that affected the left temporal lobe in such a fashion that he tested out as a conduction aphasia on the Boston Aphasia Exam. He presented with severe word-finding deficits and produced marked phonemic paraphasia when repeating and reading orally. His comprehension was well within normal limits; he had full control of his limbs and had no ambulatory difficulties at all. His syntactic constructions were of the paragrammatic form, where the automaticity was reflected in the production of matrices held together by the well-placed functional morphemes – both free and bound; intonation was quite natural. It was clear that this patient only perseverated when undergoing confrontation naming with objects, pictures of objects, or larger depictions of scenes. That is to say, this patient’s perseverative behavior was tied to his responses within the deafferentated system of lexical access. Nevertheless, when operating within this response domain, the patient appeared focused on the task and in control of the search activity; at least he “felt” that way until the utterance act happened to him. The present essay will concentrate on the verbal descriptions that the patient offers of his startled “qualia” and how it “felt” for him to have intended willfully and conscious control to produce a target word, but where instead a recurrent perseveration happened to him – quite out of control, rapid, encapsulated and “automatic.”1 I will try to relate to the startled reaction of surprise, which must have an eerie twinge to it for the patient, since it happened within a cognitive surround of voluntary activity. That is, the patient was not encumbered by diminished attention or focus, the horizontal faculties that are intact during conscious and controlled willful activity. The essay will consider several some philosophical aspects of the qualia of agency, where the normal person will have the “feeling” of conscious existence during a volitional movement, such as raising the arm to an internal command to raise the arm. An external command to raise the arm may bring on other complicating factors, which I will not pursue here, since failure on movement to verbal command is possibly indicative of an apraxia of sorts – verbal or limb. In any event, I will make an attempt to interpret the feeling of surprise of the patient who perseverates recurrently as a result of straddling the border of the automatic and the willful. I will conclude by considering the need to evaluate the patient with perseveration in more depth, concentrating on “the whole patient.” I would also call for more elicitations of the verbal descriptions of these patients as to just how they “feel” when the perseverates happen to them. In a sense, we are attempting to get into “the mind of the patient” that makes these types of responses. Furthermore, at least as concerns the patient described here, it appears that the whole word recurrent perseveration startles the most. Non-word productions of perseverates that are formed, say, by phonemic carry over do not seem to “catch the mind” of the speaker as clearly as the whole-word perseverate. I am also unaware of any studies or mere observations of startle qualia on the heels of the productions of non-perseverated paraphasias in the fluent patient. HB: (cuing pt.) “Is that paper”? HB: “Is that a TV”? HB: “Is that a toothbrush”? HB: “Tell me what you do with a book”? HB: “What do you do with a pen”? HB: “What do you do with a door”? DW: “Pepper, uh…duce…pepper, oh Lord. Here we go again with that. Several aspects of this patient’s responses should be mentioned. First, the predilection recurrent perseverate “paper” and its many phonologically similar trochaic associates occurred over a period of testing that stretched for roughly a half year. Second, In the first session, his clinical therapist and I were talking with the patient about the news, and we asked him what you read for that. Several minutes went by as he struggled for the word “newspaper.” After much directed search, his frustration led to tears; we went to something else. This episode seemed to have caused the patient some degree of anxiety, for which some investigators have suggested at least a partial causative role in perseveration (e.g., Allison, 1966). The discussion with DW remained on the topic of the news of the day, and in a less confrontational conversation, he said the word “newspaper.” He then said a bit shaken that he did much better “at home” when there was no confrontational clinical command/request to do things – such as say, read and repeat words. This we know, but I mention it here only to point to the initiation of the productions of his predilection form “paper.” I have no other account of why he may have been subject to the recurrent production of that high frequency trochee. Buckingham and Christman (2004) suggested that perhaps a metrical foot template could be subject to perseveration as well. We pointed to the large class of whole word-like or real word productions of trochaic forms, most of which were either “paper” or carry-over perseverative blends, such as “playper” “klubber” “slayper” – all strong/weak trochaic forms. There is a clear lexical effect here because without a doubt, the highest frequency two syllable words are the trochees. This should not be difficult for the connectionists to simulate. Another extremely important point is that although on repetition, DW claimed that he “loses” the word to be repeated or, he claims, “It’s right there, then gone.” On the other hand, he could easily point to the correct picture out of a group when he was provided the spoken name by the examiner. We could delay his response, but upon showing him the picture subsequently, he had no trouble pointing to the correct one. This caused us to reassess our original suspicion that he had a short term auditory memory span. It is most likely that his articulatory attempts on repetition served to erase the original acoustic stimulus from the operating buffer. This would not have occurred on silently pointing to pictures of spoken words. We note that he never perseverated on this pointing task. Although he could not read printed words aloud and perseverated often on oral reading, he could easily match pictures with printed words. He could distinguish minimal phonemic pair pictures, such as “bee” and “pea” or “mail” and “pail.” Nowhere on this task did DW produce recurrent perseveration. I am not aware of any collection of self reports for each kind of perseveration, but I would suspect that, at least for continuous perseveration, clonic perseveration and other more motoric recurrent utterances that there would be less instantaneous puzzlement at having such non-planned forms come to utterance. There may be some truth to Sandson and Albert’s (1984) claim that an attention deficit may underlie continuous perseveration, but this is certainly not the case with DW’s recurrent perseveration. Furthermore, the literature on “stuck-in-set” perseveration has pointed to failures in switching focus or attention from one to another task domain. Perhaps there is something cognitively unique in the patient with recurrent perseveration that allows it to happen to the patient, when the patient can nonetheless focus, attend, and shift these normally. Perhaps it is that continuous perserveration is simply a motor loop phenomenon and that stuck-in-set is not primarily a lexical access disruption at all, but simply one of focus shift to a different attention set. At least for one of her recurrent perseveration patients, Basso (2004) argued that attention was not the cause of the perseveration. She writes, “TS1 (treated subject #1) was unable to stop his perseverative verbal behavior even when he was aware of the perseverations and attempted to stop it” (2004, p. 388). Attention was not an issue. In any event, it would be interesting to inquire in some way about the patient’s qualia with these two forms of perseveration. Qualia, again, is the philosopher’s term for how it “feels” to be in a conscious mental state. They ask “how does it feel” to see red, hear a noise, smell a rose, to which I would add “to feel you are in charge, in control.” This is the essence of what some call consciousness, and a primary “feel” here is one of agency. Jason Brown (1988, 1996, and 2005) has developed a microgenetic model of the unfolding of cognitions of all kinds. He attempts to characterize the role of the self in terms of distinct “feels” experienced as processing proceeds. One reads much of these self feels through Brown’s descriptions of the microgenesis of cognition. There has still be no final word by Brown on the issue of qualia and the perseverating patient, but there have been many occasions where he has touched ground with what I am briefly outlining here. In past papers, Brown has focused on certain of the frontal lobe perseveration types of A. R Luria, many of which turn on one or another type of “stuck-in-set” perseveration, which seem to be caused by lesions of the meso-limbic connections from frontal cortex that involve dopaminergic systems. In Brown (1988) he discusses frontal lobe perseveration cases where, “…the patient is aware and can describe inappropriate performances but cannot correct them” (p. 327). He discusses their attentive verbal descriptions of their failures to perform on tests like the Wisconsin Card Sorting Test, which is the classic measurement of one’s ability to NOT get “stuck in sets.” He goes on to say that, “The presence of error awareness and an ability to describe the correct activity without being able to alter it has been observed by many authors” (p. 327). I am claiming that we need to collect and take a serious look at these self reports for a fuller understanding of the individual patient in each case. Degree of awareness is a very difficult item to measure, but Brown would claim that the temporal lobe patient would tend to have less degree of awareness than the frontal patient, when he writes that this frontal lobe patient may have an additional temporal lobe dysfunction since even he suffers from some degree of unawareness. Nevertheless, Brown plows the cognitive field of consciousness through internal “feels” that reflect the patient’s (he says, “the self”) self reports of their derailments. Brown’s descriptions of typical left temporal lobe patients with aphasia and paraphasia are that “Such patients may have little insight into their paraphasic errors” (p. 328). At least DW maintains a good degree of awareness of the fact that he is perseverating – but only post utterance. In his chapter on “Autonomy and agent causation,” Brown (1996) once again traces a persons awareness “feels” of being in control – or “agency.” Without overly simplifying Brown’s complex mental-physical microgenesis, I have been trying to account for DW’s puzzled and startled reactions to his perseverations as a kind of cognitive/consciousness garden path jolt, where the typical “feel” of agency is abruptly cut off when the consciously and attentively searched for target is replaced by the automatic deliverance of the recurrent perseverate; it just happens. For Brown, there are several components of agent causation, among which is “…the feeling of spontaneity in decision-making (and) the feeling that the self as a cause and the action as an effect are distinct occurrences” (p. 104). Brown goes on to write that, “…agency requires a self in consciousness in a particular context” (p. 106). In the context of the recurrent whole word perseveration in DW, the sudden withdraw from the feeling of agency in the patient who can at least instantaneously monitor post-articulatory perseverates would seem to be disconcerting to the extent of puzzlement. effort of thinking does not help in their production. Stark (1988) wrote at length on the monitoring of post-production and the monitoring of pre-production; the two are distinct. Pre-production monitoring is often labeled as “prepair.” Stark cites the work of Karmiloff-Smith, who focuses upon pre-conscious access as a modular metaprocedure, where “prepair” refers to the more recondite notion of operations within encapsulated and fast cognitive reflex systems of automatic spreading activation; it is “incipient” cognition and is not computed by the sentient/conscious self. The “prepairs” are a production of the cognitive pre-conscious modular system, which, because they are reflex-like and automatic, they are considered to be “dumb,” but as a sine qua non of our cognition they are truly not so dumb. We just can’t help them along. Many simply claim that both types of repair are “self-repairs,” but they occur at different processing levels. It could very well be that the automatic prepairs are in reality the structural constraints build into the system as a result of the architectures of the language inputs to the system, which are induced by that system as language is acquired. These are the constraints we study in “optimality theory” (Prince & Smolensky, 2004, and that are simulated in connectionist work, such as Wheeler & Touretzky (1997) and as discussed in den Ouden & Bastiaanse (2005). For Stark (personal communication), a prepare would occur when the patient was asked to name a cigarette and would say, “No, not a cigar,” and then would name the cigarette correctly In this case, the would-be error was caught, as indicated by the “no…not a …” What must have happened for this to occur is that somehow the speaker – before uttering - penetrated the modular processes. On the face of it, this would seem strange. The speaker became consciously aware of the reflex that activated “cigar,” in which case the automatic process somehow was accessed only to be instantaneously rule out by the subject. Again, how were the modular processes penetrated to the pre-production point of awareness? Post-utterance monitoring is quite different, but if some plan external item escapes from the metaprocedures that does not meet with the conscious intentions of the self, one would expect some startle reaction; in Freud’s office it might be an embarrassment. The pre-production processing represents one of the most complex situations for the clinician when it comes to rehabilitating the recurrent perseverations of a patient. Of this there can be no doubt. So, deliberate and automatic processing are operationally independent as Stark (1988) emphasizes. However, performance in any given task must necessarily require an interaction of both. Therefore, an automatic production of the plan external perseverate would necessarily cause a mental state of startle; the recurrent perseverate is incongruous. The automatic perseveration may very well come wrapped within overall controlled/strategic processing, and it would evoke a conscious feeling of helplessness, placing the patient for an instant at the border, so to speak, of consciousness and unconsciousness – a mixed feeling of agency and non-agency, having a will – then losing it. How strange when perseveration happens to a patient. Stark (1988) discusses the patients with fluent aphasia, who, in agreement with the current typology of perseveration, most often present with recurrent perseveration – the left temporal lobe lesioned patient. Albert and Sandson (1986) claim that it is recurrent perseveration that is most often part of an aphasia, and there they believe it to be an integral part of the symptom-complex. And, recently Martin and Dell (present volume) have shown just how similar in nature recurrent perseverates are to paraphasias. They are subject to semantic, lexical and phonological factors. Any linguistic analysis of recurrent perseveration will reveal and has revealed very similar architecture and form constraints regarding both. It is also likely that for the three types of perserveration, distinct neuropharmacological systems or mixes of them are involved. But the neurochemical accounts still must await further behavioral analyses of the perseverating patient. Three candidates for explanation have been offered for recurrent perseveration: disruptions of inhibition of post-activated elements and faulty memory recall. A second is where the onus is placed on a lethargy of post-activation decay rates, where what goes awry is an overly slow rate of return to resting states. Another explanation is gaining strong support of late. It claims no inhibition problem, nor any lethargy in decay rates. Rather the new accounts place the onus squarely on what the lesion does directly to neuropsychological domains of action and perception. Each symptom complex will affect certain domains of cognition and leave others unharmed. The perseveration will only be observed in the responses elicited in the damaged components. The weakened connectivity in the affected domains will be such that decay rates of post activated elements gain the upper hand by fiat, allowing for the non-intended plan external elements to appear once again. Both semantic and phonological associations become involved as well, because they can up the activation rate of a previously uttered word, boosting it accordingly into post-articulatory action. If for whatever reason the symptom-complex improves and the patient recovers to one degree or another, the perseveration will diminish accordingly without being tampered with by the clinician at all. Taking her neurolinguistic hat off and putting on her clinical garb, Stark (1988, p. 206) discusses the difficulty that faces the therapist with recurrent perseveration. First, somehow the solipsistic metaprocedural system must be penetrated so that pre-articulatory tendencies towards perseveration might be monitored and repaired. We have already discussed the unlikelihood of this ever happening. Stark (p. 296) claims that this penetration of the modular processing would be exacerbated by any increase of the rate of production. Jargon aphasics have often been observed to speak with a somewhat enhanced rate. In any event, she is correct to point out that the paragrammatic matrices of the adult with fluent aphasia are often replete with typical paraphasias and recurrent perseverates (see Buckingham, 1985, for examples of this). Clearly, however, the automaticity of the perseverations is a tough clinical nut to crack. In recent years there has been a marked increase in focus on the individual person with aphasia and its sequalae, the client as a whole person dealing with her disabilities inside the home, outside the home, at work, at play and in the rehabilitation unit. More is being made of the ecological aspects of stroke, TBI and the dementias and more ethnographic research is being done on the multifarious settings of aphasic victims. The client is being approached as a complete individual, normal in all respects except communication. Part of this trend I would hope would be more attention paid to their self reports and introspections on their problems – even while they suffer from the aphasia as opposed to after recovery. Recent publications are indicative of this increased attention to the individual subject with aphasia and quality of life (Worrell & Holland, 2003; Bing, Pound & Swinburn, 1999; and Bing, Duchan & Pound, 2006) Along with these, have been some recent attempts to penetrate some degree of automaticity and unconscious control, “…to bring perseverative behavior to patients’ level of awareness and help them suppress perseverative responses and produce non-perseverative, correct naming responses” (Helm-Estabrooks & Albert, 2004, p. 203). Hopefully, the foregoing points in this chapter will serve to warn the reader that this is not an easy thing to bring about; it forces the patient to steer between the Scylla of the automatic and the Charybdis of the conscious. The border between is worthy of a Borges short story. Helm-Estabrooks and Albert (2004) write that the best candidates for their TAP (Treatment for Aphasic Perseveration) should be: “Fully alert with at least moderately preserved auditory comprehension and good memory skills, as indicated by formal test scores (and they should have) some confrontation naming ability but moderate to severe perseveration in the form of recurrent perseveration, as determined by the procedure described in the TAP methodology section” (p. 201). It is not the point of this chapter to give any details of this program or its success, which have been notable. neuropsychological system." The support for this explanation is two fold. First, recurrent perseveration only appears when the patient is confronting stimulus-response tasks in the damaged domain. Other tasks do not reveal the perseveration. Second, as Basso (2004) has shown, there is a marked fall off of perseveration, not because it receives any rehabilitative management, but because the intervention focus on the disrupted neuropsychological behaviors themselves; as they improved, the perseveration waned. The final word is not out on all of this competing theory and rehabilitation practice, but the simulations of this scenario are powerful and were part and parcel of the renewed accounts put forth for recurrent perseveration. 1. Qualia, loosely defined, refers to the inner contents of the “feel” of sensing things. What it is to “see” a red object as red must somehow be characterized and the rather nebulous notion must at least have a label, so that, whatever it may turn out to be, it at least can be subject to scientific and philosophical consideration. In psycho-physical parallelism or identity theory, the claim is often that the physiological activity stimulated by the physical characteristics of the red object run in parallel with or can be identified with the perceiver’s qualia of “seeing red” (Buckingham, 1986). The qualia would be quite different in an agnosic who “perceives” but does not realize he perceives or is unaware; he simply can make no sense of the object “seen.” Jason Brown’s (personal communication) model of microgenesis does not restrict qualia to the individual self, but rather he links qualia with subjectivity and claims that subjectivity is limited by the world. I will continue to incorporate the term qualia, but I will be referring to inner “feels” of the human and the occasionally offered self-reports of these states of mind “feels.” It would be an interesting project to inquire more deeply into perseveration through the lenses of Brown’s microgenesis of cognition, where the intransitive verb “to feel” is paramount in describing mentality at multiple levels of processing. Albert, M., & Sandson, J. (1986). Perseveration in aphasia. Cortex, 22, 103-115. Allison, R. (1966). Perseveration as a sign of diffuse and focal brain damage. British Medical Journal, Nov 5; 2 (5522), 1095-1101. Basso, A. (2004). Perseveration or the tower of Babel. Seminars in Speech and Language, 375-389. Brown, J. (1988). The life of the mind: Selected papers. Hillsdale, NJ: Lawrence Erlbaum Associates, Publishers. Brown, J. (2005). Process and the authentic life: Toward a psychology of value. Lancaster, UK: Ontos Verlag. Buckingham, H. (1985). Perseveration in aphasia. In S. Newman & R. Epstein (eds. ), Current perspectives in dysphasia. Edinburgh, UK: Churchill Livingstone. Buckingham, H. (1986). Language, the mind, and psychophysical parallelism. In I. Gopnik & M. Gopnik, eds., From models to modules: Studies in cognitive science from the McGill workshops (pp. 209-228). Norwood, NJ: Ablex Publishing Corp.
Buckingham, H. & Christman, S. (2004). Phonemic carryover perseveration: Word blends. Seminars in Speech and Language, 25, 363-373. Byng, S., Pound, C., & Swinburn, K., eds. (1999). Aphasia therapy file. (Vol. 1). Hove: UK: Psychology Press. Byng, S., Duchan, J. F., & Pound, C., eds. (2006). Aphasia therapy file. (Vol. 2). Hove, UK: Psychology Press. Cohen, L. & Dehaene, S. (1998). Competition between past and present: Assessment and interpretation of verbal perseverations. Brain, 121, 1641-1659. Den Oduden, D.-B., & Bastiaanse, R. (2005). Phonological encoding and conduction aphasia. In Hartsuiker, R. J., Bastiaanse, R., Postma, A., & Wijnen, F., eds., Phonological encoding and monitoring in normal and pathological speech (pp. 86-101). East Sussex, UK: Psychology Press. Gotts, S. J., Incisa della Rocchetta, A., & Cipolotti, L. Mechanisms underlying perseveration in aphasia: Evidence from a single case study. Neuropsychologia, 40, 1930-1947. Gotts, S. J., & Plaut, D. C. (2004). Connectionist approaches to understanding aphasic perseveration. Seminars in Speech and Language, 25, 323-334. Helm-Estabrooks, N., & Albert, M. L. (2004). Manual of aphasia and aphasia therapy. (2nd ed.). Austin, TX: Pro-Ed. Martin, N., & Dell, G. S. (this volume). Common mechanisms underlying perseverative and non-perseverative sound and word substitutions. Special issue on perseveration in Aphasiology, Jacqueline A. Stark (ed.) Pp. 1002-1017." Prince, A., & Smolensky, P. (2004). Optimality theory: Constraint interaction in generative grammar. Malden, MA: Blackwell. Sandson, J., & Albert, M. (1984). Varieties of perseveration. Neuropsychologia, 19, 591-594. Stark, J. A. (1988). Aspects of automatic versus controlled processing, monitoring, metalinguistic tasks, and related phenomena in aphasia. In W. U. Dressler & J. A. Stark (eds. ), Linguistic analyses of aphasic language (pp. 179-223). New York: Springer-Verlag. Wheeler, D. W., & Touretzky, D. S. (1997). A parallel licensing model of normal slips and phonemic paraphasias. Brain and Language, 59, 147-201. I'm Hugh Buckingham's sister, Nancy. 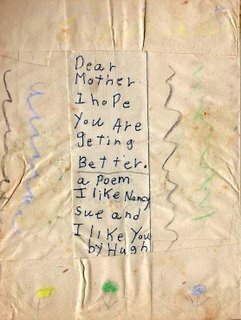 In light of the upcoming highlight of my dear bro's publishing career (being in the Exquisite Corpse), I thought it appropriate to share with you the very first poem Hugh ever wrote......to our mother in the hospital after she gave birth to me. It was in March of 1951. I scanned a copy of it from my babybook in case you were interested in adding it to this next issue. I think its juxtaposition with his linguistic jargon is pretty funny. As the poem belongs to me, you have my permission to print......it will be our secret, tee hee! And what a surprise to Hugh!